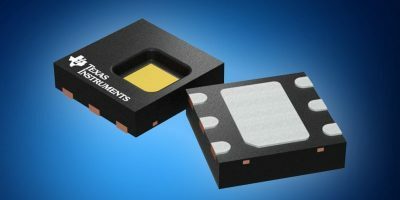 Distributor Mouser Electronics has added Texas Instruments’ HDC2080 humidity and temperature digital sensor. It offers high accuracy and low power consumption in a compact package, reports the distributor and is suitable for a range of IoT and environment monitoring applications. The TI HDC2080 humidity and temperature digital sensor is a capacitive-based device that uses an integrated heating element to dissipate moisture and condensation. The sensor integrates multiple digital features, allowing for the use of programmable input thresholds to deliver system wake-ups and alerts without needing to rely on a microcontroller to monitor the system. The HDC2080 sensor’s low power consumption allows developers to place their microcontrollers in deep sleep mode, because the sensor can initiate measurements without input from a microcontroller. The high-performance sensors offer a typical humidity accuracy of ± two per cent and a typical temperature accuracy of ±0.2 degrees C.
The sensor features an auto-measurement mode to initiate humidity and temperature measurements, enabling efficient performance in applications with power-budget restrictions. The sensor is designed for battery-operated systems and supports a supply voltage range of 1.62 to 3.6V. With an operating temperature range of minus 40 to 85 degrees C, the sensors can be safely used in applications such as home appliances, smart home devices, smart thermostats, HVAC systems and inkjet printers. The HDC2080 humidity and temperature digital sensor is supported by the HDC2080EVM, a simple plug-and-play platform that features an MSP430F5528 microcontroller and a USB interface, for communication between the HDC2080 sensor and a PC. The module’s included software graphically logs humidity and temperature data, and the module also allows access to the sensor’s configuration registers.